I'm working, or trying to start working, on a full "PC Suite"-like application to deal with Android phones. One of my intentions is to have a feature that allows the user of the application to type on his/her PC physical keyboard and see the output on their phone, whether the phone is connected via USB cable, Bluetooth, or WiFi; a feature I used to intensely use with MyPhoneExplorer for Sony Ericsson phones. 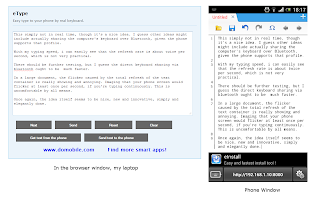 This led me to do a quick search about the subject, and I stumbled upon an app in the Play store called eType, from DoMobile. So, I downloaded the free version to my phone, and started playing around for a few minutes. The app's idea is actually impressive, on the creativity side, that is. It ba sically sets a web server on the phone, that you open via your browser and type. Whatever you type in your web browser, on your PC, is then transferred to a med-app in form of keyboard, or input method, that is identified by the phone's OS. Unfortunately, it works only via WiFi, meaning that there should always a WiFi network that both the PC and the phone are connected to, in order to utilize this app. Now, if the idea was really creative, the implementation was very poor, in my opinion. Yes, the app works, and the text does appear on the phone's text container, but I couldn't not notice that the app doesn't actually work in real-time; instead it refreshes the text container every half a second, according to my estimation. And when I said "refreshes" I really mean that the app deletes and retypes all the text in the text container each time, about twice a second. This causes two annoyances: first, if you type fast on the computer's keyboard, you'll really feel the lag of the text appearing on the phone. This would even be worse if you decided to look into the phone's screen and type, instead of looking into your PC's monitor. Second, refreshing the whole amount of text in a relatively large document, I'm talking two paragraphs, for instance, results in blinking. With the refresh rate being about twice a second, one feels the phone really flickering. I still insist on that the idea is nice, probably DoMobile would work more on it to overcome the negative sides.